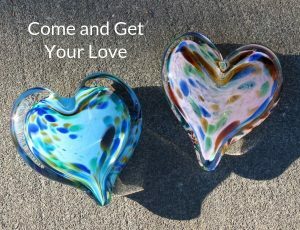 For your Valentine or any time, solid glass heart-shape paperweights feel good in the hand and the heart. These individually handcrafted art pieces come in dozens of colors and patterns, no two exactly alike. Solid glass hearts are approximately 3″ wide. Order below or contact us for custom colors or bulk orders.